১. "Japan finishes Tokyo Sky Tree". Mmtimes.com. Retrieved 14 June 2013. ৩. 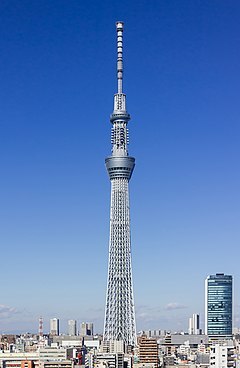 "Japan Finishes World's Tallest Communications Tower". Council on Tall Buildings and Urban Habitat. 1 March 2012. Retrieved 2 March 2012. ৪ . "Tokyo Sky Tree" Emporis. Retrieved 2 March 2012. ৫. "Tokyo Sky Tree construction starts". The Japan Times(15 July 2008). Retrieved 15 July 2008.